PACEMAKER BELFAST 24/03/2019 'A cash machine has been torn from the wall of a filling station in Irvinestown, County Fermanagh. 'The incident happened at Dromore Road around 04:05 GMT on Sunday. Political and business representatives have expressed frustration with the PSNI after criminal gangs used the cover of night to rip yet another ATM from the wall of a business. The incident at a filling station in Irvinestown, Co Fermanagh, discovered yesterday morning, brings the tally of such criminal raids this year to six, with one further attempted theft. A bank in Newtownabbey had been attacked on Friday morning. As early as mid-February the media was reporting that the PSNI had set up a dedicated team of detectives to investigate the ATM thefts, following what police described as “an upsurge” in such raids. But yesterday Retail NI called for a high-level meeting with the police and the retail and construction sectors. The PSNI responded that the issue is “a priority” for a dedicated team of detectives across NI, working with the banking and retail sectors, but that they needed help from the public. Retail NI chief executive Glyn Roberts said: “The growing number of these attacks is now a major cause for concern, given that these criminal gangs are able to hit retailers and bank branches in every part of Northern Ireland. “I will be seeking urgent clarification from the PSNI on the status of their investigation. ‘Retail NI will also organise an urgent meeting of representatives from banks, the construction sector and the PSNI to discuss this crisis. The Danske Bank premises in Newtownabbey was found to have had its ATM ripped out on Friday morning. A burnt-out van with the remains of an ATM were found in the Carnaghliss Road area of Crumlin the next morning. A dedicated team of detectives is working across NI specifically on the issue, working with the banking and retail sectors to stop the gangs, he said. A 32-year-old man has been charged in relation to an ATM theft in Fintona in December 2018 and police are “actively pursuing a number of lines of inquiry in relation to the others”. There have been six ATM thefts and one attempted theft so far in 2019, he said, and businesses and the communities concerned “are bearing the brunt financially”. He encouraged those storing heavy plant machinery near commercial premises to ensure it is kept “locked, secured and immobilised”. Anyone living near filling stations and shops should also call police if they hear machinery in the early hours, or notice power outages, he said. 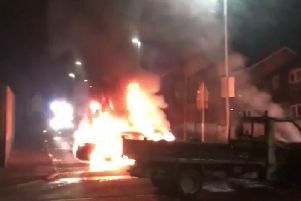 DUP councillor Raymond Farrell said this form of criminality is “sadly becoming too regular an occurence” and that “greater resources are needed to be given to the PSNI to deal with this”. However, UUP councillor Diana Armstrong said “a great team” ensured the Irvinestown business was operational again by yesterday afternoon. “The police, banks and financial bodies need to urgently devise a strategy to halt these crimes,” she added.